Greta, a 5-year-old German shepherd, smelled propane and woke up her owners, saving their lives. Greta, a 5-year-old German shepherd, smelled propane and woke up her owners, potentially saving their lives. Confused, Ken Walsh looked at the clock. Outside the bedroom door, his 5-year-old German shepherd, Greta, was barking and crying. Usually the quietest dog the Walsh family owns, Greta was on the verge of waking the whole household. Walsh got out of bed to quiet her, but Greta was insistent, stubbornly corraling her human to the kitchen. And that's where he smelled it. Greta is a rescue, taken in by the Long Neck-area family after behavioral issues threatened her future. Walsh trains dogs and is in the process of starting a nonprofit animal rescue, he said. The family has five dogs and three cats. "I rescued Greta knowing she was a great dog under her patchy past," Walsh said. "She has come a long way." "I thank God for bringing her into my life." Walsh said Greta has more than returned the favor. He's convinced that she saved him, his wife and their 14-year-old son when she started barking and got Walsh out of bed Nov. 13. When he got to the kitchen, he quickly realized the propane stove was leaking gas into the air. It had already filled several rooms and could have easily killed the sleeping family. Not only can inhaling propane suffocate you, but it is extremely flammable. 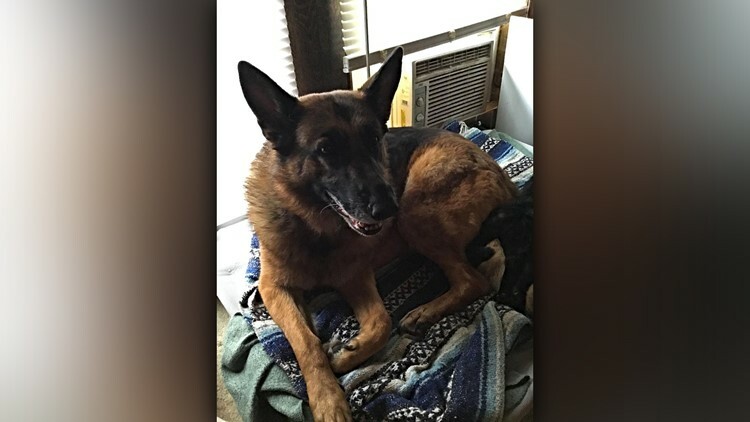 Walsh said it was one of the family's other four dogs that accidentally turned the propane on while attempting to jump on the kitchen counter. Greta could sense that something was wrong. The German shepherd has been well-rewarded for her heroism, Walsh said. First, he shared the story on Facebook, getting thousands of likes. Then, he cooked Greta up a treat: steak and sweet potatoes. “We made her a special dinner," said Walsh, who also plans on treating Greta to some vanilla ice cream. Walsh, who encourages people to adopt pets from shelters instead of shopping at pet stores, says there's a moral to Greta's story. Even dogs with behavioral problems can make a valuable addition to your family, he said. "Please remember to help shelter animals this Christmas season," he said on Facebook. "They need love ... If you are looking for a forever friend, take a look at your local shelter."